For delicate, moist fish, we use a bed of shallots to prevent the fillets from directly touching the skillet. We stumbled upon this method of cooking fish when Ezra was in utero and we wanted a quick, delicious way to squeeze in a serving of low-mercury fish every week. Now that we have a toddler on the outside, it is still our family's favorite way to serve fish--Ezra likes it so much we didn't have time to get a photo of him eating it, so here is one of him grinning after polishing off his portion. Heat olive oil in a skillet. Saute the shallots and sage for just a minute. Carefully lay the fish on top of the shallots and turn the heat to medium-low. Add enough white wine to immerse the fish halfway, season with salt and pepper and cover. Cook for a few minutes, then turn the fish over and cook, covered, until it is white throughout. We had a fantastic version of this comforting and nourishing casserole from Three Stone Hearth that was a big hit with the whole family, so we decided to try to duplicate it in our kitchen. 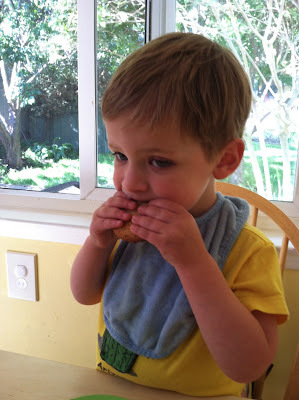 Ezra couldn't help much with this recipe, but happily ate his portion. 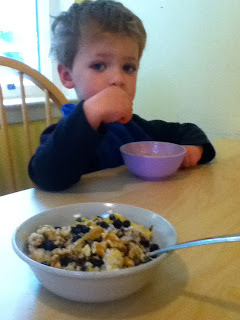 We soaked our rice overnight with a tablespoon of yogurt and one cup of water. You can, of course, skip this step if you aren't afraid of the phytic acid fairy. Preheat the oven to 350F and grease a small casserole dish. Add 1 cup stock to the rice and water, bring to a boil, then reduce to a low simmer until the liquid is fully absorbed. Heat the butter in a skillet and saute the leeks over low heat until very soft. Set the leeks aside and saute the chard until soft. Bake for about 45 minutes, until the casserole is bubbly. Ezra loves slow-cooked kale, which we often eat by itself, but sometimes serve over whole wheat pasta and sausage. Ezra and I took the kale outside with a bucket of water and washed each leaf thoroughly. 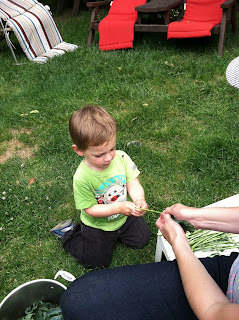 Then we ripped out the stems and ripped the kale into small pieces. We weren't quite ready to come inside and start cooking at that point, so we fed the kale stems to the chickens. 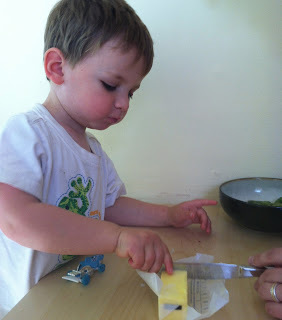 Once inside, Ezra cut the butter (and helped himself to a pat) and I took over from there. Heat the butter in a cast-iron skillet with a lid. Saute the garlic and kale until the kale is wilted. Add the chicken broth, turn heat to low, and cover. Cook, stirring occasionally, for about an hour, until the kale is soft -- adding more liquid as needed. Add the vinegar, salt to taste, and serve. If you're the kind of hippie who has a mason jar of sauerkraut brewing on the kitchen counter (between the jars of water kefir, yogurt and kombucha), this is a great way to add a new kraut recipe to the rotation. If you don't brew your own kefir and kombucha, you might not be watching enough Portlandia. Heat two tablespoons butter in a saucepan. Saute the onions and garlic until the onions are soft. Add the caraway seeds and saute for 2 more minutes. Add the beets, potato, thyme, salt and just enough water to cover. Simmer until the beets are fully cooked. Remove from the heat. Take out the thyme and stir in the dill. Puree half of the soup in a blender or food mill, then stir it back together. In a frying pan, saute the sauerkraut in the remaining 1 tablespoon butter until softened. Stir the kraut into the soup, reheat if necessary, and taste. If you would like more sour flavor, add apple cider vinegar to taste. Serve hot, with sour cream or yogurt. Ezra is still building up his spice tolerance, so when we make this carrot salad, we set aside his portion before we mix in the chiles. In a large bowl, mix the carrots and lemon juice. In a small skillet, heat the oil. Add the oil, mustard seeds and curry leaves. When the mustard seeds begin to pop, pour the mixture over the carrots. Add the minced jalapeno, stir and salt to taste. 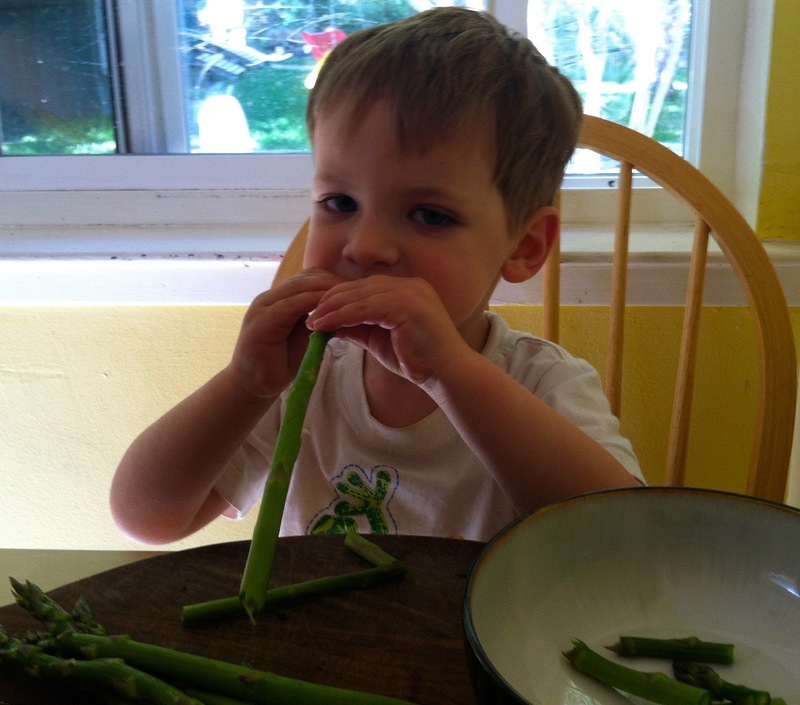 Ezra helped with this recipe by breaking the asparagus into pieces (while eating most of the tips), spreading the cheese into the pie pan (while breaking off pieces of the crust to eat) and cutting the butter (and eating it, then cutting again, and eating it, and then finally cutting one last piece for the recipe). Maybe I should have fed him before we started. 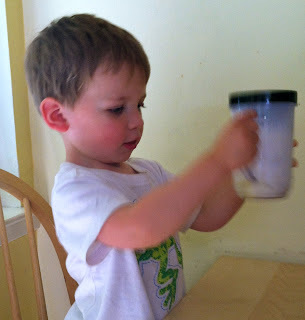 I experimented with putting the eggs and milk in a jar so he could shake instead of stir. 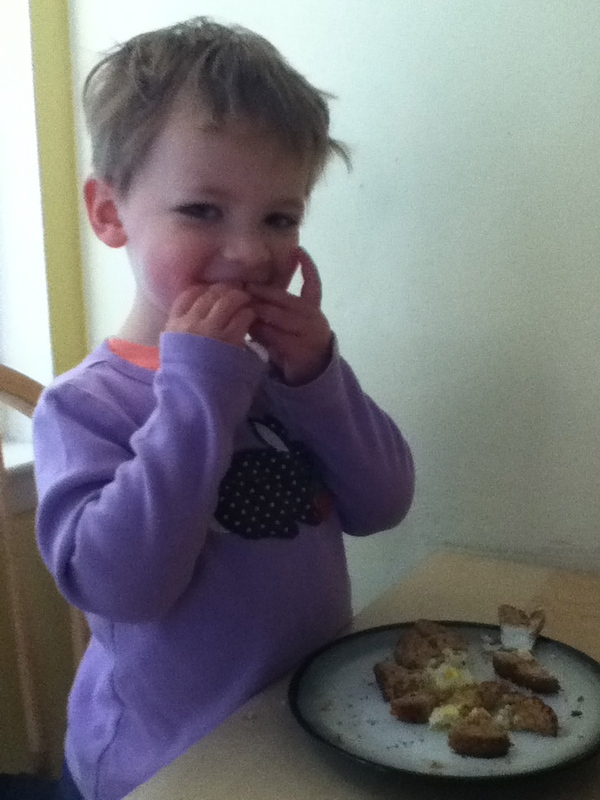 (I'm not willing to see my precious backyard chicken eggs splattered all over the kitchen.) 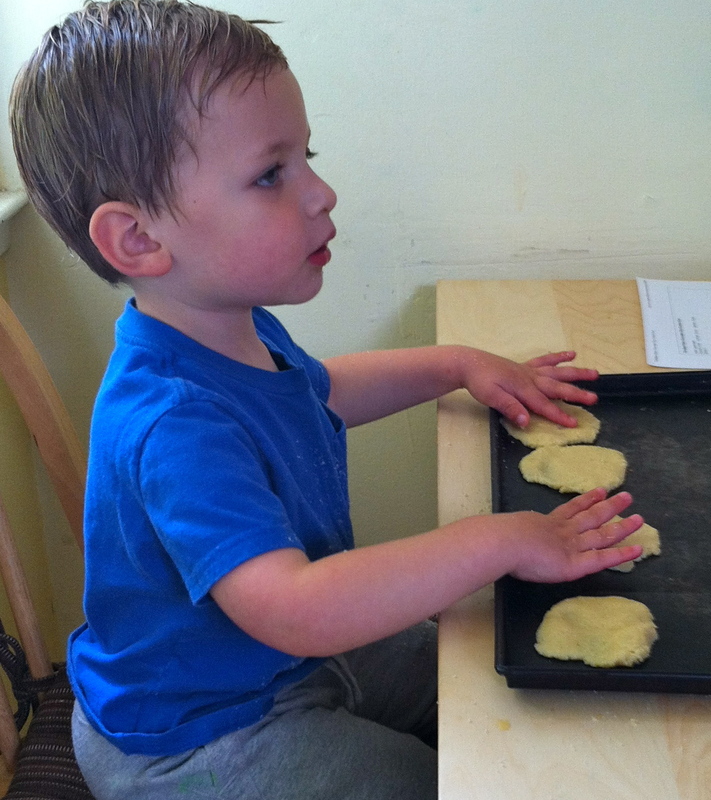 His chubby toddler arms didn't really have the strength to blend the eggs, but it was fun. Preheat the oven to 350F. Heat the butter in a skillet, then saute the leeks and asparagus until the asparagus is al dente. Whisk together the eggs, milk, salt and black pepper. Spread the cheese in the bottom of the crust, then add the asparagus and leeks. 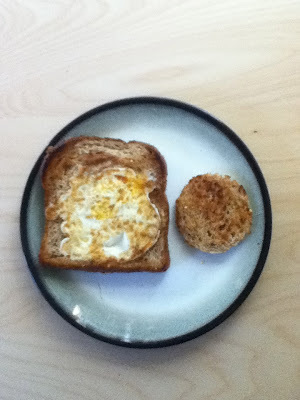 Pour the egg mixture over the top. Bake for 45 minutes, or until the center is set. 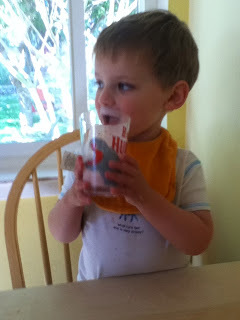 Strawberry and Banana Smoothie: Ezra joins the team at I Heart Kale! Is anyone still reading? If so, are you wondering where we've been for the last three years? 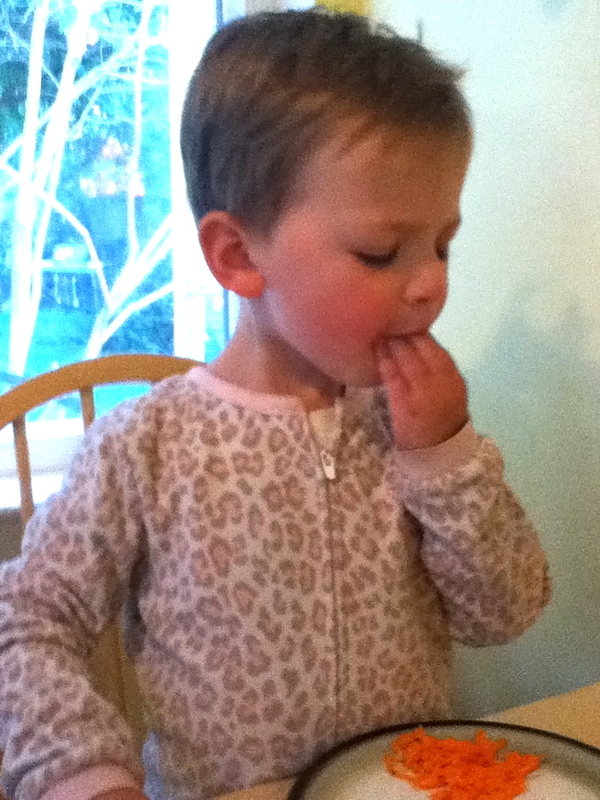 Ezra helped to peel the banana, then we held a butter knife together and chopped the banana and strawberries. I thought the knife work would be difficult, but he's been watching us cook long enough that I only needed to steady the knife while he did the rest of the work. He put the chopped fruit into our Magic Bullet mini-blender. I measured out some milk, which he poured into the blender... and on the table... and himself... and the floor. 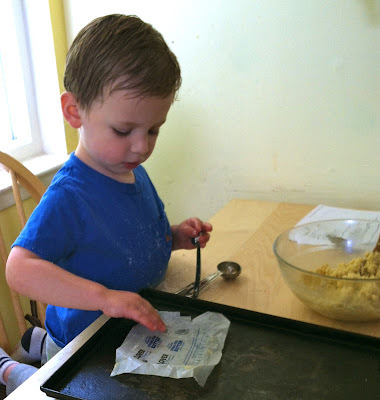 Then he got out a rag and mopped up the spill. 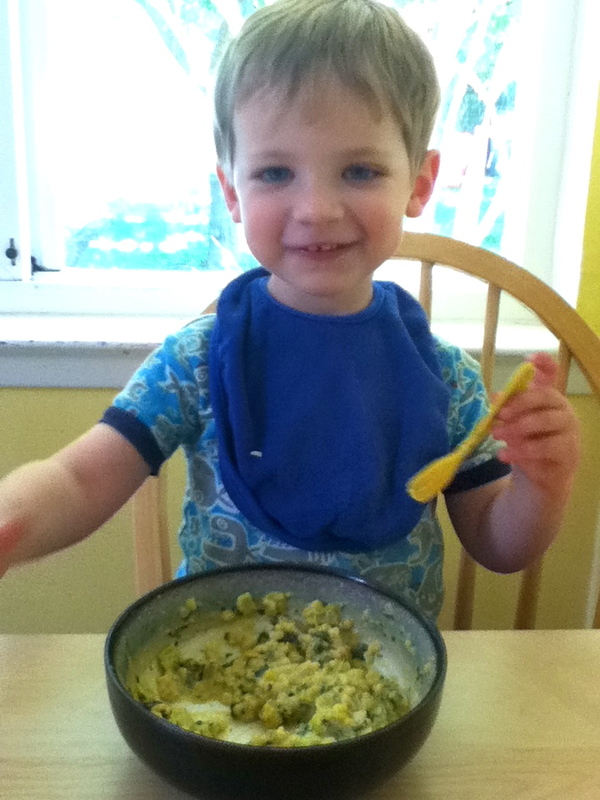 He sprinkled some nutritional yeast into the blender and scooped in yogurt with a big spoon. We screwed on the blender base together and I did the pureeing. It took about five times as long to make our smoothie as a team, but we're laying the groundwork for Ezra to whip up four-course tasting menus for us in our old age!